FIND TRUE LOVE THIS SPRING AND SAVE 45%! "JEREMY IRONS AND JOAN ALLEN ARE CLOSE TO PERFECT! will have the ladies quivering." 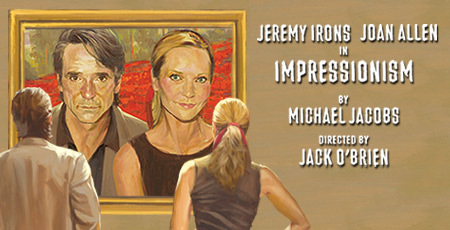 Tony Award® winner Jeremy Irons and Tony Award® winner Joan Allen return to Broadway in Impressionism, a new play about the many shades of the human heart. Directed by three-time Tony Award® winner Jack O'Brien, this is the kind of love story that reminds us all that time heals, laughter helps and young love isn't necessarily the best love of all. "Filled with brazen sweetness and openhearted humor." "Practices the art of romantic comedy with intellect and wit." Offer valid through May 24. Visit ImpressionismThePlay.com for complete performance schedule. Offer is subject to availability and prior sale and valid on select locations. Offer cannot be combined with any other offer and may be revoked at any time. Not valid on prior purchases. Blackout dates may apply. Ticket limits apply. No refunds or exchanges. Telephone and internet orders are subject to standard service fees. All prices include a $1.50 facilities fee. Offer valid through 5/24/09.